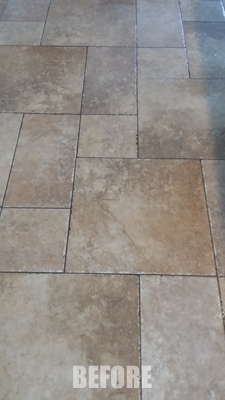 Here is a set of before and after shots on a recent tile and grout cleaning in Tampa FL. This tile floor is in a rental property that had the same tenants for the last 4 years. The owner was certain the tile had not been cleaned, let alone professionally cleaned during that time. The tumbled tile is beautiful and the random tile sizes makes for an excellent mosaic pattern. The grout was originally a medium beige color, but had taken on an almost black appearance. It made the floor look considerably older than it was. Grout gets dirty from regular use and cleaning with dirty mop water. High traffic areas can build up an incredible amount of dirt and completely change the appearance of the floor. It’s important to have your tile and grout cleaned professionally once a year to restore it to its original color. Make sure to get it sealed as well. 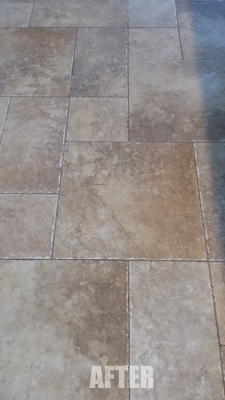 In Tampa FL the humidity and heat can cause grout to flake and erode. Sealant does not cost much more and it will protect your floor from early wear damage and help keep it clean as well. Tile is a great flooring choice and has become more popular in the last few years. However, tile is more expensive to have professionally cleaned and requires regular maintenance, but in the end it is worth it. If you need professional Tile and Grout cleaning call Chem-Dry of Tampa FL to get a free in home estimate. Call Chem-Dry of Tampa for tile and grout cleaning needs.